While most of you know, I don't LOVE the snow, I will say...it's beautiful in that it brings this blanket of soft silence, peacefulness & a calm that is hard to explain, but you can feel it all around. I love that it feels new, pure, clean & like a fresh start. I also love that a good pop of red is a perfect contrast to it. 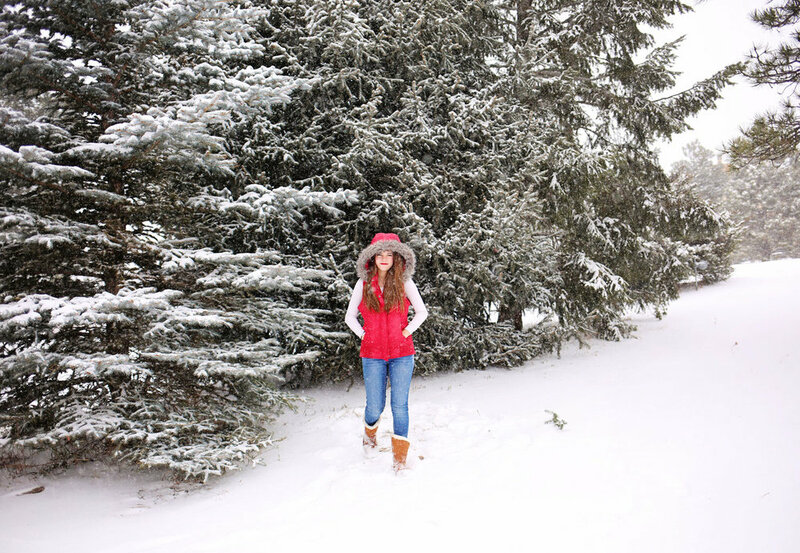 I had this vision (I even created a Pinterest Board on Winter Photography Inspiration) a while back that if we ever got dumped on or at least a pretty snowfall, I would drag Sadie outside wearing RED to capture some beautiful contrasted images. So, TODAY, that's exactly what I did. I of course had MY vision & she of course had HERS. LOL!!! We were clearly NOT on the same page, but with a little begging & pleading...I won! ;) I knew with this 14 year old teenager, I wouldn't have very much time. Boy, was I right. I literally nailed the 2 shots plus 2 frames in under 3 minutes. YEP!!! 3 minutes was all I got. She was cold, it was windy & she HATED what I asked her to wear. But darn it...I told her she'll love what I got and yep; she did!!! Mom's are always right! Ha! Win-Win all around. I simply wanted 1 close-up with a furry hood, because who doesn't love a furry hood wintery close-up that shows off your eyes. Plus her eyes look especially green with the pines behind her. 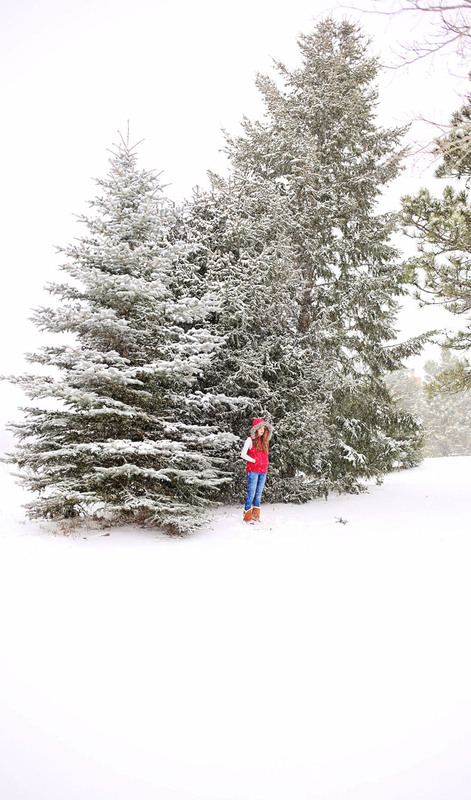 I also wanted 1 pull-back shot showing off the pop of red against the blowing white snow & pines. The other two were the extra freebies...one she was actually smiling in because she was ditching me; the other cranky from the wind/cold. Ha! I still like them both! Stay warm. Enjoy the view. Feel the peace.